In zoology, a horn is one of a pair of hard, pointed, often permanent projections on the head of various hoofed mammals (ungulates) consisting of a core of living bone covered by a sheath of keratin and other proteins. 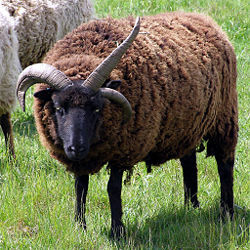 Examples of animals with true horns include antelopes, cattle, buffalo, and goats. The term also is used to refer more specifically to the hard keratinous material forming the outer covering. While both a bony core and a covering of keratinous material constitute the definition of a "true horn," there are many other hard structures projecting from the head of animals that do not meet these requirements and yet are referred to commonly as horns. These include the antlers of deer (dead bone without horn covering), the horns of rhinoceroses (thickly, matted hair that has keratin but lacks a bony core), and the ossicones of giraffes (skin-covered bony knobs formed from ossified cartilage). 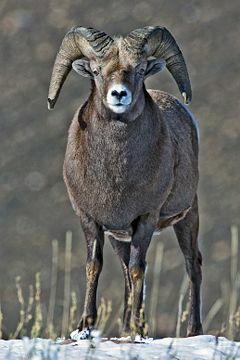 Horns provide a diversity of important functions for the animals bearing them, such as defense from predators, tools in fighting other members of the species for territory or mating, feeding, courtship displays, and cooling. Humans also have utilized them for such valued purposes as making musical instruments, carrying items (gunpowder and drink), Traditional Chinese Medicine (TCM), and for making tools, furniture, and decorations. However, sometimes animals have been hunted just for their horns, such as in TCM or selectively hunting bighorn sheep with huge horns as hunting trophies. Such practices have had a detrimental impact on those animals that stand out because of their horns. True horns are composed of a bony core covered by keratinous material. Bones are semi-rigid, porous, mineralized structures that consist of cells in a hard matrix and that form part of the endoskeleton of vertebrates. Although externally they may appear to be solid structures, in reality they are composed of living bone tissue interlaced with blood vessels, nerve fibers, and so forth. Keratins are tough and insoluble fibrous structural proteins that form the chief, hard, nonmineralized structural component of horns, hair, wool, nails, claws, hooves, and other vertebrate tissues (as well as part of various invertebrate structures). Only chitin rivals the various keratins in terms of their toughness as biological materials. True horns are found only among the ruminant artiodactyls (even-toed ungulates), in the families Antilocapridae (pronghorn) and Bovidae (cattle, goats, antelope, and so on). These animals have one or occasionally two pairs of horns, which usually have a curved or spiral shape, often with ridges or fluting. In many species only the males have horns. Horns start to grow soon after birth, and continue to grow throughout the life of the animal, except in pronghorns, which shed the outer kertinous layer annually, but retain the bony core. Unlike the horns of the family Bovidae, the horn sheaths of the pronghorn are branched, each sheath possessing a forward pointing tine (hence the name pronghorn). Similar growths on other parts of the body are not usually called horns, but spurs, claws, or hoofs. The term "horn" is also popularly applied to other hard and pointed features attached to the head of animals in various other families. Giraffidae. Giraffes have one or more pairs of bony bumps on their heads, called ossicones. These are covered with furred skin, and although they look as if they ought to have horns on them, they do not. Cervidae. Most deer have antlers, which are not true horns. When fully developed, antlers are dead bone without a horn (keratin) or skin covering; they are borne only by adults (usually males) and are shed and regrown each year. Rhinocerotidae. Rhinocerouses have one or two projections on the upper snout that are commonly referred to as horns. 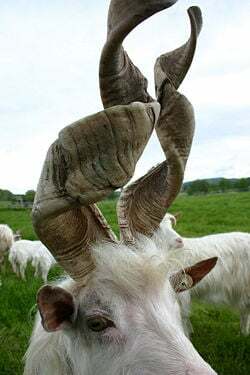 These "horns" are not true horns, but are epidermal derivatives, composed of a solid mass of thickly matted hair—keratin—that grows from the skull without skeletal support. That is, these projections are made of keratin and grow continuously, but do not have a bone core. Ceratopsidae. The "horns" of the ceratopsians like Triceratops were extensions of its skull bones although debate exists over whether they had a keratin covering. Monodontidae. Male narwhals have a single long tusk, a modified tooth, which looks like a horn, and is twisted like that of the fictional unicorn. Insects. Some insects (such as rhinoceros beetles) have horn-like structures on the head or thorax (or both). These are pointed outgrowths of the hard chitinous exoskeleton. Some (such as stag beetles) have greatly enlarged jaws, also made of chitin. Members of the family Acrididae are known as the "short-horned grasshoppers" and those of the family Tettigoniidae are known as the "short-horned grasshoppers" because they typically have antennae shorter or longer than their bodies, respectively. The Horned lizards (Phrynosoma) have projections on their heads consisting of a hard keratin covering over a bony core, similar to mammalian horns. Many mammal species in various families have tusks, which often serve the same functions as true horns, but are in fact oversize teeth. These include the Moschidae (musk deer, which are ruminants), Suidae (wild boars), Proboscidea (elephants), Monodontidae (narwhals), and Odobenidae (walruses). Polled animals or pollards are those of normally-horned (mainly domesticated) species whose horns have been removed, or which have not grown. In some cases, such animals have small horny growths in the skin where their horns would be normally–these are known as scurs. A ram with a third horn growing out of its head. Animals utilize their horns in a variety of ways. They may be used in fighting, whether for defense from predators or for fighting members of their own species for territory, dominance, or mating priority. Horns may be used in feeding, such as to root in the soil or to strip bark from trees. Some animals with true horns use them for cooling, the blood vessels in the bony core allowing the horns to function as a radiator. In animal courtship, many animals use horns in displays. For example, the male blue wildebeest (Connochaetes taurinus)&mash;an antelope that is characterized in both sexes by horns that are smooth and initially curving downward or outward—reams the bark and branches of trees to impress the female and lure her into his territory. A shofar made from the horn of a Greater kudu, a woodland antelope, in the Yemenite Jewish style. Horns have been used by people for many purposes throughout history. Some bovid horns are used as musical instruments, for example the shofar, which is often made from the horn of a ram (although any animal except a cow or calf can be used) and is used for Jewish religious purposes. The shofur is referenced as far back as the book of Exodus. These have evolved into brass instruments in which, unlike the trumpet, the bore gradually increases in width through most of its length—that is to say, it is conical rather than cylindrical. These are called horns, though today they are made of metal. Drinking horns' are bovid horns removed from the bone core, cleaned, and polished and used as drinking vessels. The keratin (horn), sometimes including keratin from other parts of animals, such as hoofs, may be used as a material in tools, furniture, and decoration, among other uses. In these applications, horn is valued for its hardness, and it has given rise to the expression hard as horn. Horn is somewhat thermoplastic and (like tortoiseshell) was formerly used for many purposes where plastic would now be used. Horn also may be used to make glue. Horn bows are bows made from a combination of horn, sinew, and usually wood. These materials allow more energy to be stored in a short bow than wood would. "Horn" buttons are usually made from deer antlers, not true horn. Use of animal horns is controversial, especially if the animal was specifically hunted for the horn as a hunting trophy or object of decoration or utility. Some animals are threatened or endangered to reduced populations partially from pressures of such hunting. Chan, S., A. V. Maksimuk, L. V. Zhirnov, and S. V. Nash. 1995. From Steppe to Store: The Trade in Saiga Antelope Horn. Species in Danger. Cambridge, UK: Traffice International. ISBN 1858500680. Hall, B. K. 2005. Bones and Cartilage: Developmental and Evolutionary Skeletal Biology. Amsterdam: Elsevier Academic Press. ISBN 0123190606. Solounias, N. 1988. Prevalence of ossicones in Giraffidae (Artiodactyla, Mammalia). J. Mamm 69(4): 845-848. Retrieved October 11, 2008. Vrba, E. S., and G. B. Schaller.2000. Antelopes, Deer, and Relatives: Fossil Record, Behavioral Ecology, Systematics, and Conservation. Yale University Press. ISBN 0300081421. Retrieved October 11, 2008. This page was last modified on 16 October 2008, at 18:24.